Today, the difficulties Bertha Benz had to overcome during her first long-distance trip are hard to imagine. After all, streets in the modern sense did not exist. In the country, you only had field tracks many of which had two deep ruts from the wheels of the horse carriages, with the front wheel of the three-wheeled motor car bumping over the turf ruined by the horses' hooves. In the towns, the situation was a little better, because the big streets were normally paved. When traveling somewhere today, our GPS navigation system displays our exact location, and how long we still have to go. Even without the GPS system, it is easy to find our way because road signs are found everywhere. What did Bertha Benz find? Nothing! There were no road signs! The few local coachmen commuting between the towns knew their way. The passengers in the coaches were usually busy holding on to something, were longing for the end of the tiresome trip, and hardly had any orientation through the side windows. At that time, when people had to travel long distances they normally preferred going by train. And exactly this was the solution intrepid Bertha Benz found for her problem. With her automobile, she went along the railway lines, and could not lose her way like that. Carl Benz had only been able to estimate the fuel consumption of his automobile because he had only driven short distances on paved roads. But he had misestimated it greatly, because given the road conditions, the motor car needed so much fuel that it had to be refilled after a few kilometers. However, filling stations did not exist, either. As a result, the three courageous automobilists obtained Ligroin, a detergent used as a fuel at that time, in the Wiesloch pharmacy. 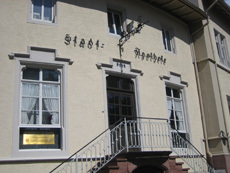 Thus, the pharmacy in Wiesloch, which still exists today, became the world's first filling station. To visit it, you should best leave your car in the 'Palatin' parking garage in Wiesloch because you have to walk a few yards into the pedestrians' zone. Author's note: At that time, Bertha Benz bought fuel in a pharmacy, whereas I buy it in the filling station – but when I see today's fuel prices, it occurs to me that I might be in a pharmacy again.